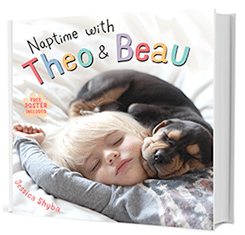 I am beyond excited that Naptime with Theo & Beau a children’s board book by my dear friend Jessica Shyba is hitting bookshelves on February 3, just in time for Valentine’s Day. I can’t think of a better gift for kids and parents-to-be. Photos of Jessica’s toddler son Beau napping with the family’s rescue puppy Theo circulated around the world last year making it onto virtually every major news show, into international newspapers and on everyone’s Facebook newsfeed. 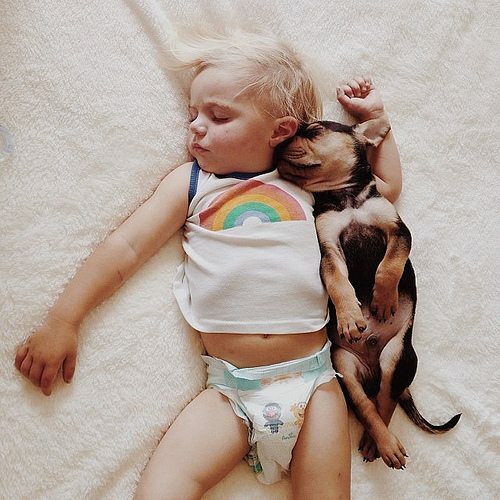 Jessica had been documenting her son and puppy’s joint daily napping sessions on her Instagram account, MommasGoneCity, when boom, the photos went massively viral. You recognize them, yes? Well, Jessica continues to photographically document her son and puppy in their daily napping ritual. But now, you can also share Theo and Beau’s friendship and bedtime story through the most delightful children’s picture book. It’s appropriate for ages 2 months to 102 years old. Everyone loves pictures of babies and puppies, but put them together cuddling and it’s the most irresistible combination. I am ordering a gazillion copies of Naptime with Theo & Beau to distribute to friends and family of little ones, and will be gifting it to every parent-to-be, baby and toddler for the rest of my life. I don’t know much about the book business, but I hear that new release preorders are super important to build press buzz and sales momentum. I hope that if you and your family are fans of Theo and Beau, that you’ll preorder as well. Jessica is the most wonderful person and I can’t tell you how absolutely proud of her I am. Let’s help her, okay? Jessica and her publisher have an added incentive for preordering Naptime with Theo & Beau. Send in your preorder receipt and receive a signed bookplate with a special message from Theo and Beau. You can preorder Naptime with Theo & Beau at Amazon and find out the details of getting your own signed bookplate by clicking here (available through 2/28/15 or until supplies last). I love this photos, I get tear every time I see them (and I go back and revisit them when I need a little sweetness). It’s just everything that’s good and right with the world! Cute photos but would have liked more words or a story to justify the spend as a good book for kids – hard to tell but amazon previews show it more like just a picture book of author’s kid and dog. Remember, a portion goes to the SC Shelter where they got Theo….worth paying a little more for, i think.